Happy New Year to all my blog followers. 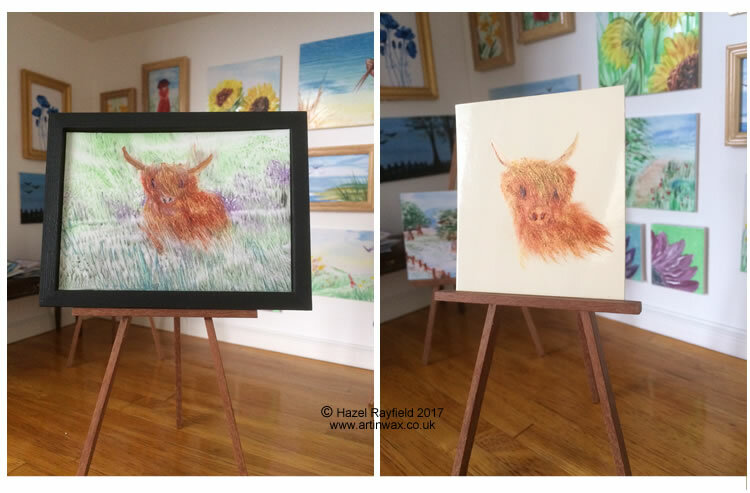 I was thinking of a subject for the first blog post of the new year when I received a commission to paint a miniature highland cow for a dolls house owner in Scotland, so I thought the first commission of the year would make a great first blog post of 2017. 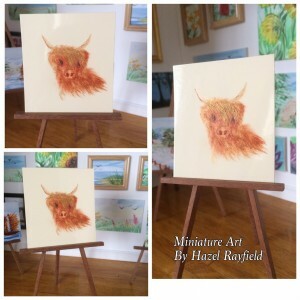 The miniature collector asked if I could paint a highland Cow picture for her dolls house, as this is a her favourite animal and she has several pictures in her home and it would be fun to have a miniature painting for her miniature property. I painted two for choice and she has order both, the landscape has the cow in a heather filled grassland, this is an impressionist piece and has been supplied in a black wooden frame size 3 x 4 inches. The other piece of art is a on encaustic cream gloss card and is a modern, more of a portrait style just 2 1/2 inches high. The photos shown here are on display in my own miniature property : The Gallery which is my 1:12 scale art gallery. I love painting commissions, especially miniatures, these are only paint in my style, I do not paint reproductions. If you would like to commission a piece at a specific size and subject matter please contact me for more details.